Posted 2/11/2019 3:51pm by Josie Hart. Our 2019 CSA Shares sold out very quickly! For those on the waitlist that did not get in, we apologize. Below we have created a referral list of other CSA's in the area doing distributions throughout the Denver area this summer. If you were able to purchase a share, congrats! After selecting and purchasing a vegetable, you have access to our add-on shares. We still have spaces open for ALL add on shares including the FLOWER BOUQUET SHARE and the YAK share. Visit LOG IN and Check out our other products. CSA renewals open January 7! Posted 12/21/2018 3:55pm by Josie Hart. Happy Holidays and a happy CSA renewal season! We will start the shareholder renewal process on Monday, January 7th for all current CSA shareholders. If you would like to renew your CSA membership, you have the entire month of January to do so. Starting in February we will open up shares to those on the waitlist and to the general public in March . We will send out an email notification before the final week of renewals. To renew your shares, visit our homepage on or after January 7. We hope you had as much fun cooking and eating the produce as we did growing and harvesting it! As usual we've tried to keep our share prices reasonable, while also not undercutting other local farms. We want our shares to remain accessible to the families that have supported us, so keep in mind you can use the split payment option. If you are able to come to the farm to help out for three hours a week as a working shareholder you'll receive a reimbursement at the end of the season, making the cost of the share even more reasonable. We also would like to encourage you to consider becoming a Supporting Shareholder. These shares include a donation which directly subsidizes one SNAP share, as well as helping provide low-cost produce through our Farm Stand in Food Desert program. Feel free to read through the new share information here. Posted 10/30/2018 12:05pm by Josie Hart. Thanks to everyone who already signed up for the winter egg share. You still have one week to sign up--until November 6. After November 6 we will close the sign-up period. Don't forget to vote as well! - Pick-ups will occur every Thursday 9 a.m. - 5 p.m. at 1007 York St. inside the Visitor Center. - Please bring a check for the amount of $22 (Paypal option is still being worked out by our farmer, stay tuned). - Please do not bring in your old egg cartons (Denver can recycle them). - First pick-up will occur THIS THURSDAY, November 1. - You will receive ONE ADDITIONAL FREE DOZEN for the first pick-up (total of 2 dozen). Posted 10/20/2018 10:31am by Josie Hart. Each year it seems to come so suddenly, the final week of distributions! This week we'll have plenty of onions, leeks and garlic, beets, cabbage, spaghetti squash, and some baby hakurei turnips that made it through the freeze. Our last plantings of bok choy and salad mix and head lettuce didn't quite make it through. On Tuesday we will be moving distribution across the street to the Congress Park parking lot, by the swimming pool because a few thousand more people than usual will be visiting York St. for Glow at the Gardens. Many, many thanks to our wonderful seasonal crew of farmers: Katie, Maddy, Chloe, Royce and Adam. And so much gratitude for all the hours put into these crops, this soil, and this farm by our amazing volunteers. The CSA is truly a collective endeavor, all made possible by you, the shareholders. Thank you! Posted 10/13/2018 8:37am by Josie Hart. If you haven't been to Pumpkin Fest yet, come on down! It's great to see our usually quiet and tranquil farm host thousands of people, and food trucks and beer tent and kid's games and general festive energy. And as a plant person that it all centers around a winter squash is even better! With snow and bitterly cold temperatures tomorrow we are ending Pumpkin Fest a day early, so come revel in the sun today! We're hoping for two more weeks of distributions but our final seedings of crops like radishes, hakurei turnips, lettuce and bok choy haven't sized up quite yet so depending on how cold it gets over the weekend we might have some rather spartan last pick-ups. Chatfield Farms is located down in a real low spot surrounded by the hogback on one side, high ground with housing developments on two, and then Chatfield Reservoir on the other. This arrangement can protect us from a lot of the more extreme weather, such as two recent hailstorms in which the housing developments literally had to plow the streets of hail and we didn't even get a drop of precipitation. It also has the tendency to trap cold air right above our fields so I know that our fields are usually 2 degrees colder than the predictions for the Chatfield Reservoir area, and they have been dropping the lows all the way down to 16 degrees, so that could spell trouble for our baby crops! Yesterday we nestled them under a couple of layers of rowcover, so that should help, and actually, some snow would help to insulate them a lot. Our farm partner Amish Acres would like to continue providing you with farm-fresh eggs throughout the winter. If you would like to sign up for eggs, please email josie.hart@botanicgardens.org to find out more. We will not be able to provide egg shares if we have fewer than 20 shares, so invite a friend or neighbor to sign up, too! *Please note the exact share may change due to weather or crop conditions. Posted 10/5/2018 6:32pm by Josie Hart. Anyone that wants to harvest herbs, tomatoes or peppers before a potential frost Monday should come on down to the farm on Saturday from 8-10 a.m. Park in the gravel lot and walk over to our perennial herb garden next to the Hildebrand Ranch House. If you haven't had a chance to look through the house, we'll have it open as well. It's an amazing chance to step right into some of the history of the land where your food is grown-- one of my favorite parts of Chatfield Farms and unique to any farm I've been a part of. Look for the online survey out soon. Please be sure to fill it out and give us your feedback on your CSA experience. We are so grateful for your presence in our community and we love hearing from you all. We have one final CSA cooking class coming up - please look for a separate registration link email out next week. Our farm partner, Amish Acres would like to continue providing you with your farm fresh eggs throughout the winter. If you would like to sign up for eggs, please email josie.hart@botanicgardens.org to find out more. We will not be able to provide egg shares if we have fewer than 20 shares so invite a friend or neighbor to sign up too! Cut spaghetti squash in half, rub with oil and roast in the oven at 400 for 30-40 minutes. While the spaghetti squash is cooking, chop up your veggies and cook over medium heat with some oil. If you don’t have peppers, cabbage or carrots, or prefer other vegetables, you can substitute. For the sauce, heat the ½ cup canola oil in a saucepan and fry the garlic until golden. Add sugar, fish sauce and ketchup and stir until the sugar dissolves. Add the peanut butter and stir then add the beaten eggs. Let them set slightly before stirring. With a fork scrape the “noodles” out of your spaghetti squash into a large bowl, then mix in your other vegetables and the sauce. Top with desired garnishes and serve. Posted 9/29/2018 10:28am by Josie Hart. Open pollinated varieties set seed that will produce a plant that is very similar to the parent plant or plants, or that is “true to type”. Open pollinated varieties are generally the easiest to save seed from, but some varieties need to be carefully isolated to prevent cross pollination. Crops such as squash and cucumbers have both male and female flowers on each plant and pollen must move from one to the other. In order to save seed which will produce true to type plants, you have to make sure there are no other varieties around that could pollinate the variety you want to save. The easiest varieties to save seed from are self pollinating varieties. These varieties have both the male and female parts (the stigma and the pollen) in the same flower. Each individual plant can pollinate itself, keeping genetic variables constant. Some self pollinating crops include beans, peas, tomatoes, and lettuce. Hybrid varieties are open pollinated varieties that have been allowed to cross pollinate within the same species – seeds saved from hybrid parents will not be true to type. Producing hybrid seed is beneficial because varieties can be selectively modified for a number of traits – for example to increase disease resistance, cold tolerance, uniformity or high yield. There are many advantages to saving seed from plants you like and have produced well for you. After a few years of saving seed you'll be selecting for plants that are adapted to your specific environment, and you can also select for particular traits you want, such as saving seed from the first tomatoes you pick to encourage early maturity in subsequent generations. Reminder: Our last Gleaning Day will be October 6 from 8-10. On Wednesday, Oct. 3, from 6:30-8 p.m. at Gates Hall Denver Botanic Gardens presents Growing Healthier Together: Connecting Community Gardens and Cancer Prevention. This recipe is from Adam, one of our farmers and a certified Southerner from the coast of Georgia. Preheat oil to medium, medium/high in cast iron skillet (or other high-walled pan). Make sure oil is completely heated before putting in tomatoes. Season tomatoes with salt and pepper on both sides. Place the flour in one dish, in another place the eggs and milk, and in the third mix the bread crumbs in with the garlic powder, cayenne, and paprika. Cover the slices tomatoes in flour, then in the eggs, then in the bread crumbs. Make sure the tomatoes are covered completely in all three steps so that the bread crumbs will stick. Add the tomatoes into the pan (be careful as the oil is hot and can splash) slowly allowing each tomato space so they are not touching. Fry evenly about 2-3 minutes on each side and place to dry on a drying rack (or paper towels) so they remain crispy. Posted 9/22/2018 12:01pm by Josie Hart. Since fall is officially here and the rest of the summer crops are slowing, we'll have another Gleaning Day on Saturday, October 6 from 8-10 a.m. This time it will be mostly tomatoes and peppers, and we'll open up our perennial herb garden as well. As CSA members, you know having access to local and fresh food is of high importance, yet it's easy to overlook the children and families who are food-insecure in the Denver area. 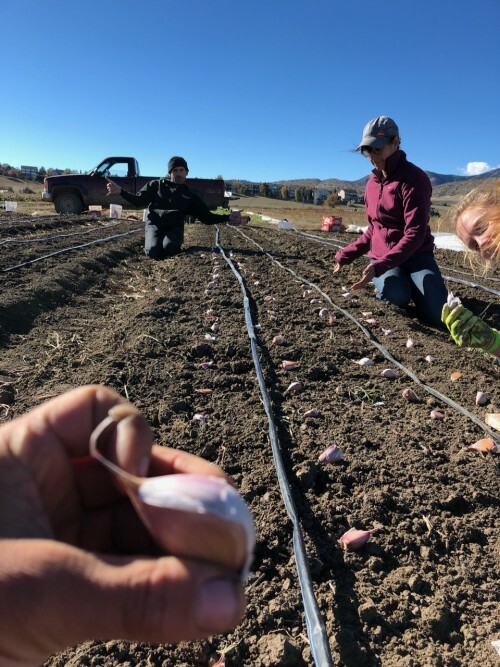 Denver Botanic Gardens has several food access initiatives, such as the Farm Stands in food deserts program, participating in the SNAP/DoubleUp Food Bucks program and through donated CSA shares as well as donations of produce to hunger relief organizations. We value quality food and all people, regardless of income and neighborhood, and strive to create avenues where everyone can access healthy food. Some of you may have heard of the Healthy Food for Denver initiative that was gaining traction earlier this summer. The initiative needed 10,000 signatures to get on the November ballot--and was successful! We want to share a few details about the initiative so you are informed for November's vote. Although Colorado is experiencing growth in many sectors and has low unemployment rates, Colorado is one of the fastest growing states for childhood hunger. - Lack of food security directly affects children's ability to perform in school and shape habits that can extend beyond adolescence. This is just a snapshot of the initiative; visit http://healthyfoodfordenver.com/ for more information. Winter sweet is a variety of Cucurbita maxima, the same type as Hubbards and Kabocha squash. The flesh is dry like a pie pumpkin but more flavorful. Their flavor will be most intense in October or November, since the starches in the plants will convert to sugars in storage. We have rather limited space, and so we will give them out now, and you can store them yourself in a cool place, or if you are as impatient as I am you can cook it on up now, the flavor is still quite nice. Heat the oven to 350 degrees. Slice pumpkin in half and scoop out the seeds (rinse and save them to toast along with the pie, they’ll be great on your next salad). Cook until tender. Let it cool a little bit then separate the flesh from the skin and puree. Mix the first 8 ingredients together. Beat in eggs. Stir in pumpkin and cream. Pour into pie shell. Bake in a 400 degree oven for 50 minutes, or until knife is clean after inserting in center of pie. Cool completely before serving. Posted 9/16/2018 9:24am by Josie Hart. Though summer crops are slowing down in earnest now (our last tomato pick was 300 pounds, down from our record of 1200 pounds!) we've still got plenty of storage crops such as winter squash, onions and garlic; and our last plantings of quick crops such as bok choy and hakurei are just up under rowcover. This year we are planning on holding distributions until the week of October 23-25, so another six weeks of produce yet to come! 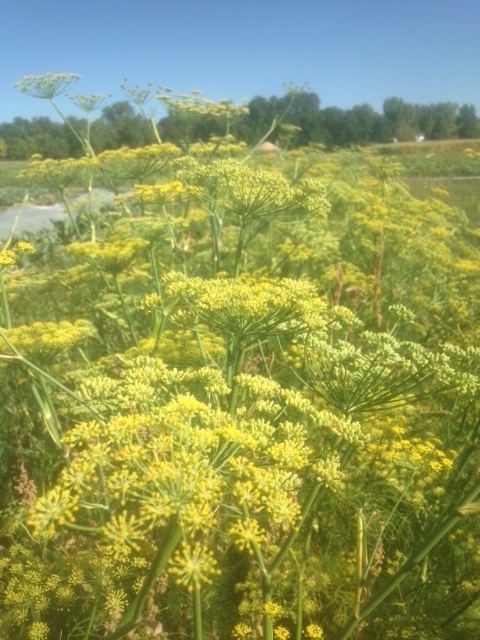 Last week we discovered a new snack: fennel flowers! We'll cut some stalks to give out, since they are super sweet and have a nice fennel flavor. I think they'd be great sprinkled on a salad. A note for Tuesday shareholders, Judiasm Your Way is happening with multiple services on 9/18, and so parking will be extremely limited.